“When news of his arrest was published in local newspapers on Thursday, a crowd of some 500 people, including traders, clerics and politicians, surrounded the town’s police station to demand he be handed over,” police official Abdul Sattar told Agence France-Presse. When police refused, the mob turned on them, beating up officers and local government officials before firing guns. The 10-year-old boy died and five others were wounded in the melee, he added. 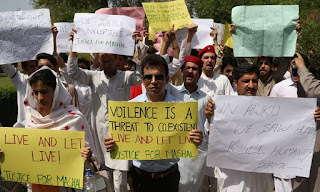 Mujeeb Qambrani, a senior local administration official, said his government had not succumbed to the mob because “we are legally bound to protect the accused”.